Nokia's entry-level Asha smartphone, the Asha 201, is now available in India via online shopping site Snapdeal, at Rs. 3,990. The smartphone is also listed on Flipkart, without the pricing and availability details. The Nokia Asha 201 was unveiled last month along with the Asha 200, 300, 303 phones. The Nokia Asha 201 measures 115.5 x 61.1 x 14 mm and weighs 105 gm. The device sports a QWERTY keyboard with a 2.4-inch TFT display with 320 x 240 pixels resolution. The Nokia Asha 201 features a 2MP camera, 10MB internal storage, microSD card slot that supports 32GB storage, 32MB of RAM and 64MB of ROM. For connectivity, the Asha 201 supports GPRS, Bluetooth and USB. The device comes with a 1,430 mAh battery, which is supposed to deliver 7 hours of talktime and 888 hours of standby time. Other features include music player, video player and built-in FM radio. At Rs. 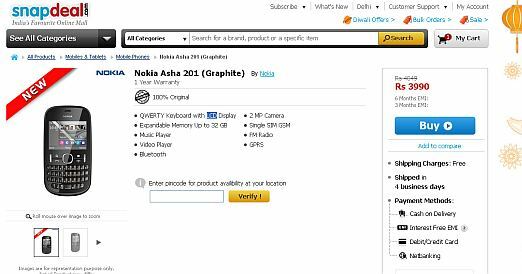 3,990, the Nokia Asha 201 will be facing stiff competition from various other Android-based budget smartphones in that price category. Nokia recently launched Asha 309 and 308 smartphones in India. The Asha 309 is the single SIM version of the Asha 308.